Space Leap : A hypnotic & soothing ambient experience to amaze! Prepare for a hypnotic, ambient experience in this physics-based, space puzzle game. 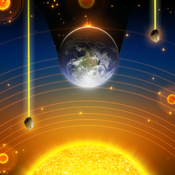 Propel into different orbits by tapping on the gravity fields. Beware of falling asteroids, beautiful but deadly nebulae, stellar wormholes and tons of other galactic hazards. Time your orbit jumps to perfection to solve the cosmic puzzles and collect star dust as you make your way to the destination Sun. Space Leap features unique physics & puzzle play, mesmerising graphics, and a soothing ambient soundtrack. Time will fly away as you get lost in space. Play through 84 levels across 4 distinct zones : Pinksmoke, Greenstar, Purplehaze, Golden Sun. Each zone adds new gameplay and puzzle elements unique to that zone. No timers, No Paywalls, No NONSENSE! Just a really beautiful, original game with tons of content where the only thing holding you back is your skill. Space Leap is a relaxing, meditative puzzle experience with beautiful audio and stellar visuals combining into something thats almost otherworldly.